Any maker worth their bits will look for new ways to challenge themselves. [Robert Fotino], a computer science student at the University of California, is doing just that: designing and building his own lightweight hobbyist game console that he has appropriately named Consolite. [Fotino] wrote his own compiler in C++ that converts from C-like languages to a custom-designed assembler that he has dubbed Consolite Assembly. 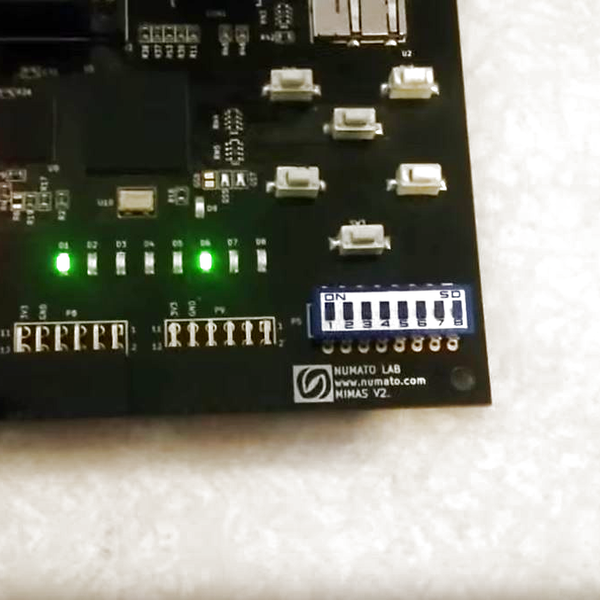 To test his code, he also wrote an emulator before loading it onto the Mimas V2 FPGA board. Presently, Consolite uses 64KiB of main memory and 48 KiB of video memory; a future version will have 32 bit support to make better use of the Mimas’ 64 MiB of on board ram, but the current 16-bit version is a functional proof of concept. An SD card functions as persistent storage for up to 256 programs, which can be accessed using the hardware switches on the Mimas, with plans to add user access in the form of saving game progress, storage outside of main memory, etc. — also in a future update that will include audio support. As it stands, [Fotino] has written his own versions of Breakout, Tetris, and Tron to show off his project. Not wanting for diligence, [Fotino] has provided thorough documentation of nearly every step along the way in his blog posts and on GitHub if you are looking for guidelines for any similar projects you might have on the back burner — like an even tinier game console. [Akiba] over at Freaklabs has been working with electroluminescent (EL) wire. An entire dance company worth! We know [Akiba] from his post tsunami radiation monitoring work with the Tokyo Hackerspace. Today he’s one of the engineers for Wrecking Crew Orchestra, the dance company that put on the viral “Tron Dance” last year. Wrecking Crew Orchestra just recently put on a new production called Cosmic Beat. Cosmic Beat takes Wrecking Crew’s performances to a whole new level by adding stage projection mapping and powerful lasers, along with Iron Man repulsor style hand mounted LEDs. As one might expect, the EL wire costumes are controlled by a computer, which keeps all the performers lighting effects in perfect time. That’s where [Akiba] came in. The modern theater is awash in a sea of RF noise. Kilowatts of lighting are controlled by triacs which throw out tremendous amounts of noise. Strobes and camera flashes, along with an entire audience carrying cell phones and WiFi devices only add to this. RF noise or not, the show must go on, and The EL costumes and LEDs have to work. To that end, [Akiba] He also created new transmitters for the group. He also changed the lighting booth mounted transmitter antenna from an omnidirectional whip to a directional Yagi. The EL wire itself turned out to be a bit of a problem. The wire wasn’t quite bright enough. Doubling up on the wire would be difficult, as the dancers are already wearing 25 meters of wire in addition to the control electronics. Sometimes best engineering practices have to give way to art, so [Akiba] had to overdrive the strings. This means that wires burn out often. The dance troupe has gotten very good at changing out strands of wire during and between shows. If you want a closer look, there are plenty of pictures available on [Akiba’s] flickr stream. We’ve seen our fair share of Tron costumes and props, but much like [Sean-h] points out, they are usually pretty bulky and baggy. He’s gone a slightly different route by starting with a wetsuit instead of bulkier items like leather jackets. The lighting is done in the same manner we’ve seen before, copious amounts of EL wire and EL tape. The additional layers of this costume were made from foam, so they could be fairly form fitting as well. Instructable user [cubeberg’s] daughter saw Tron:Legacy earlier this year and decided right then and there that she wanted to dress up as Quorra for Halloween. Being the awesome dad he is, he decided to make her costume himself, and hit the stores in search of an Identity Disc to complete the look. The toy was pretty underwhelming, and lacked the lighting that a proper Tron prop should have. He figured he had the skills to make it a bit better, so he gathered some tools, a bunch of LEDs, and set off for his workshop. He gutted the disc, cutting out any extraneous bits of plastic he could find. 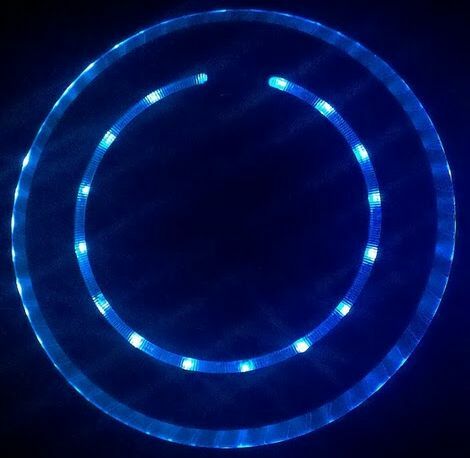 He wired up 64 LEDs between the disc’s inner and outer ring, which he controls using an ATmega 328 paired with a Max7221 display driver. He doesn’t show any pictures of what the toy looked like beforehand, but the final product looks great. We bet that his daughter is pretty pumped for Halloween to roll around – we know we would be. Continue reading to see a quick video demo of his souped up Identity Disc in action. We hope you’ve already got parts on hand for your holiday projects because shipping might be a little slow at this time of year. But if you’ve got a bag and some unused EL wire here’s a one-day project you should try. 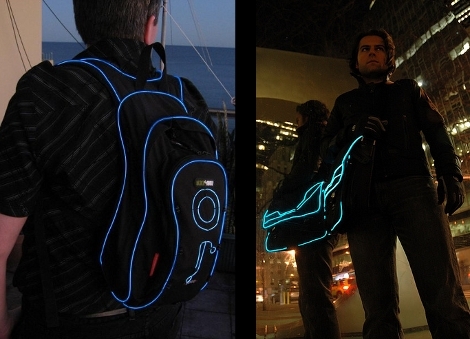 Make yourself a Tron-inspired shoulder bag, or backpack. On the right, [PT] is doing fantastic job of modeling with his electroluminescent offering. This is another Adafruit offering that holds your hand each step of the way from designing, to sewing, to wiring it up. This will go great with that glowing unitard he’s been working on. [Alan Yates] has also done a spectacular job with his Tron backpack seen on the left. He picked up his EL wire on clearance at a place called “big-W” after Christmas last year. They were selling 3 meter segments (each with their own inverter) for just $3. We’re happy he got a deal and even more pleased that he found a use for it.